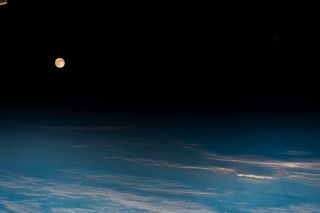 The full moon as seen from the International Space Station, in an image shared by astronaut Alexander Gerst on Aug. 25, 2018. One of the beautiful things about the full moon is that the days before and after are almost as stunning — so if you needed a little reminder to go enjoy yesterday's full moon, it's not too late. A full moon rises by Cassis castle in France on Aug. 25, 2018. The planet remains quite a sight, less than a month after it was at opposition and made its closest approach to Earth. Mars will continue to shine brighter than any stars into late September; right now, it still even outshines Jupiter.The image shows a brilliant full moon gleaming over a dreamy view of Earth's atmosphere — and in the upper right corner, there's a tiny pinprick of light, all that the photograph can capture of Mars. The Aug. 25, 2018, full moon sets over Qolsärif mosque in Russia. This month's full moon peaked early in the morning of Sunday (Aug. 26); the next full moon will occur on Sept. 24 at 10:53 p.m. EDT (Sept. 25 at 0253 GMT). After the current full moon begins to wane, near the end of this week, it will again be relatively easy to see all the planets in one night. But Gerst doesn't frame his image in the context of skywatching; as an explorer, he's focused on the potential of the moon and Mars as destinations for human spaceflight missions. His image comes just a few days after Vice President Mike Pence reiterated NASA's plan to return to the moon and land humans on Mars, in a speech on Aug. 23. The full moon rises over Chula Vista, California, on Aug. 25, 2018. Whether you see the moon and Mars as destinations or as beautiful sights, the photos are stunning.